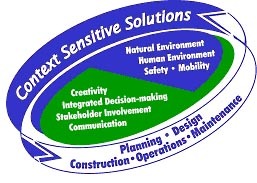 Context Sensitive Solutions (CSS) is a collaborative, interdisciplinary approach that involves all stakeholders in providing a transportation facility that fits its setting. It is an approach that leads to preserving and enhancing scenic, aesthetic, historic, community and environmental resources, while improving or maintaining safety, mobility and infrastructure conditions. The Creative Corridors Coilition process and subsequent guidelines is an example of such an effort.